Bloating is caused by trapped intestinal gases and water retention, with abdominal pain being a natural consequence. Sometimes the abdomen can even become visibly bigger. Although bloating and abdominal pain are normally short-term issues that go away on their own, there are nevertheless ways to relieve the problems more quickly. Read on for some tried and tested methods. Bloating is often caused by certain triggers, and there are a number of foods that are notorious for making bloating and abdominal pain more likely. These foods include beans, broccoli, onions, and cabbage, and so they are best avoided. Some people gradually develop lactose intolerance later in life, so it might also be useful to eliminate dairy products to see if it makes a difference in bloating. As well as the known triggers, people will also have their own personal foods that lead to abdominal pain and bloating, so knowing what these are should be a huge help. Eating more slowly and taking a short break between each mouthful is one of the best ways to protect against abdominal pain and bloating, because eating too fast can cause you to swallow air, which can get trapped in the body. Not chewing enough also leads to slower digestion, because the stomach has to break down the food in bigger chunks, and the digestive enzymes in the saliva are not given a chance to get the digestive process started. This means that the food is more likely to stagnate and give off gases. Exercise can help relieve bloating and abdominal pain in the short term by helping release gases that have become trapped in the body. In the long term, it can prevent further recurrences of abdominal pain and bloating by stimulating more blood flow to the digestive tract and helping it function more efficiently. It is not advised to do physical activity right after a meal, but it can be beneficial after half an hour or so. Bloating and abdominal pain can be caused by water retention as well as gas, and dehydration is one of the leading causes of this. The reason is that when the body is not getting enough fluid, it holds on to what it does have in preparation for emergencies. By keeping hydrated, water passes more easily through the body and does the jobs it is supposed to, such as flushing out the kidneys. 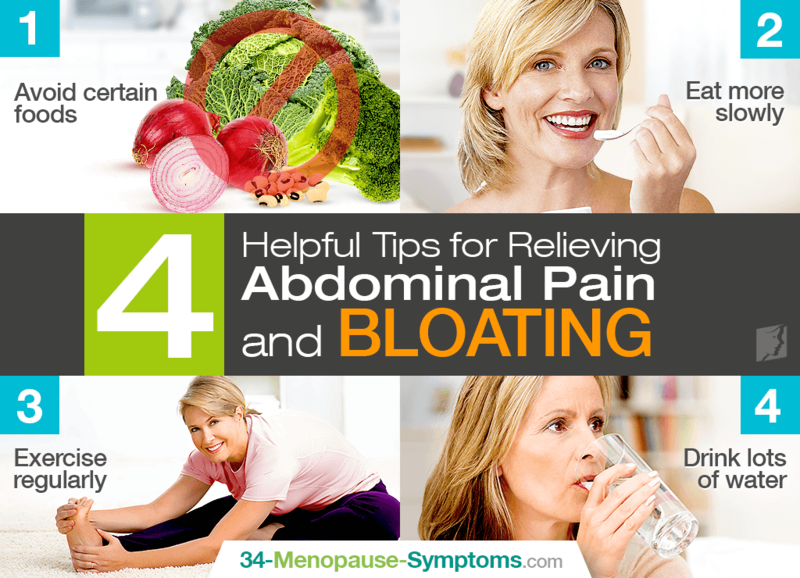 Abdominal pain and bloating are very uncomfortable and can affect everyday life. For this reason, many people want to find ways to deal with the problems. By making a few lifestyle changes, such as staying hydrated, exercising regularly, and eating healthy, these issues should be drastically reduced. Read on for some tried and tested methods to relieve bloating.